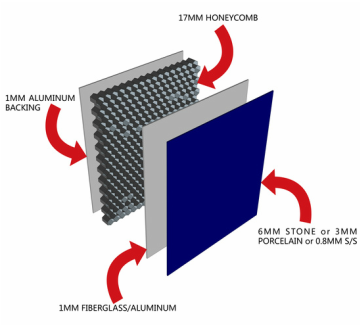 HyCOMB Panels (Non Combustible Aluminium Honeycomb Panels)- Innovative cladding system. ​• HyComb Aluminium Honeycomb panels are non combustible AS1530 compliant. • 5 to 10 times faster to install than solid heavy dimensional stone, saving construction time and reducing labour costs. • large format sizes of up to 3000mm X 1500mm in stone and even larger on pvdf coated aluminium. • huge labour savings that come from the engineered fixing system that allows for a very efficient installation process. • Stone honeycomb panel can use in exterior cladding, interior fitting out and furniture. ​• our factory produces aluminium stone honeycomb panels which are CSIRO, ASTM, BS and PSB test approved. • our panels are popular in building applications in many overseas markets such as Australia, USA, Spain, Russia, Singapore, Korea, Hong Kong, Macau and Japan. • Miami-Dade County, Floride High Velocity Hurricane Zone (HVHZ), Notice of Acceptance certification. Random samples are taken out from our production line as a specimen for testing, to ensure the stability of panel performance. Test results are recorded into a database so each specific batch of production.